1. Internet cafes: mobile data is cheap and often faster than speeds at cafes. 2. Hand painted signs: Sigh! Vinyl printed signs are quickly replacing the artistic and often whimsical hand painted signs. 3. Fee-based Photographers: I've never seen so few fee-based photographers at the Taj Mahal. The mobile phone is sending this business into the history books. Bullock carts. At least in the city. Perhaps there are more rural ones. Hand-pulled punkhas, Petromax lamps and thunderboxes. In 1956 the first-class waiting room at Chakradharpur had all these. i remember using a thunderbox at Gulmarg as late as 1968. Thekind of things I post about aren't disappearing, they have disappeared for good. Great thread , esp as I have mild fever and taken the day off. What better to do than reminisce? 1. Passport photo studios - most identification forms that require a photo now get their own in the center, be it the passport kendras or visa centers (us, UK), hence not much work for these studios, except for those who have added wedding photography as a line. 3. VCR rental shops. Unlike the blockbuster vhs tape and later DVD rental chains, in India we used to rent the equipment as well. Sometimes it would be the color TV as well. This would be for a 24 hour period or less and we'd binge watch movies. It was common in the 80s. 4. Bajaj scooters - Bajaj made geared, two stroke engine scooters under license from soemetime in the 70s to the mid 2000s. This included the legendary chetak, named after Maharana Pratap's horse. 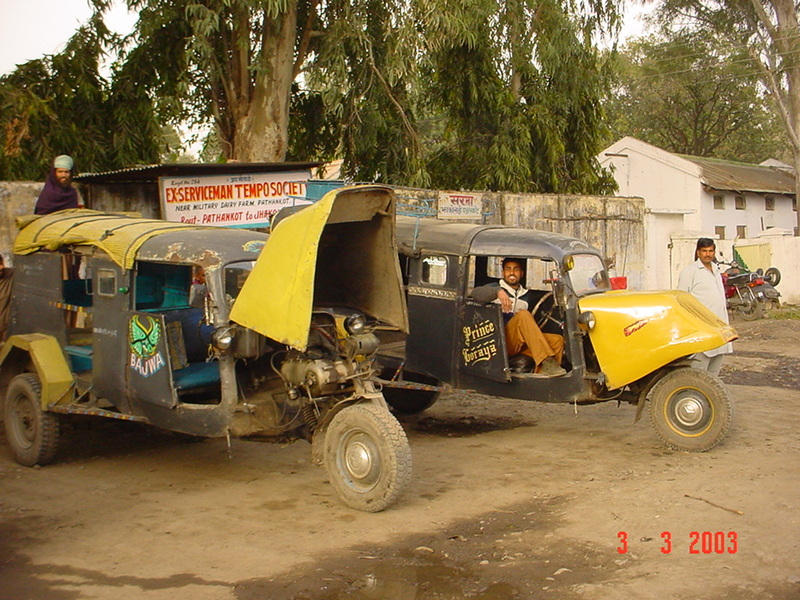 https://en.m.wikipedia.org/wiki/Bajaj_Chetak. Images of a family of four riding a scooter are a part of collective Indian conscience of all those who grew up in the 70s and 80s. I should add the Ambassador but what has really gone the way of the thunderbox is the Landmaster. That was our family car. And of course the ubiquitous DC3 Dakota on domestic air routes, I think 1964 was the last time one could fly on one from Safdarjung airport to Patna with stops at Lucknow and Banaras - at each landing and take-off eardrums popping in the unpressurised cabin. Yes, Indian Airlines - I miss them! Thunderbox? I'm not familiar with this term, Google says a "primitive, portable loo". Is that right? Interesting to read about the kalaiwala, and great photos. What is the life expectancy of chai stalls and tailors in India? Originally Posted by iamgorman What is the life expectancy of chai stalls and tailors in India? I think chai stalls have a long way to go. Near my workplace at a distance of 5 minute walk there are at least 4 tea stalls. Tailors also will have a high expectancy. Anglo-Indians. Long gone. I had some of them as teachers, and I am old enough to remember when a woman wearing pants or a skirt was obviously Anglo-Indian. Ration cards and milk cards---they may still be there but long ago became unimportant for the middle class. At one time they were essential to survival. In Kolkata, trams---they are cutting back the route network steadily to make more space for automobile traffic, which is bass-ackwards. Beggars---except in tourist spots, they are now rare. 2. Bajaj tempo - fitted with benches inside they were filthy diesel fume emitting three wheelers ferrying 12 passengers at least. I had trouble finding a photo and found one here on Indiamike! 3. Topaz blade - made by the Malhotra company , withstood all onslaughts by global giants including wilkinson sword. Now available online in bulk packs. 4. Surprisingly the inland letter card, which I thought was gone, is not! It's still there on the Indiapost website. 5. Here're a few more https://edition.cnn.com/interactive/...shing-vendors/ I think they're wrong about astrologers though, they've definitely gone up in number - they are mostly on TV and internet though. I disagree about the beggars. They're pretty omnipresent. They've just changed tactics and all, and many are wealthier in absolute terms. Many have mobile phones. Beggars haven't decreased in places of worship either, but yes I agree that the horribly and visibly poor lot have significantly reduced in the last couple of decades. Those salesmen guys who used to come around to the house selling loaves of bread or homemade pickles and snacks. I haven't seen one in like a decade. Hawkers and kabadiwaalas yelling loudly on the road. They are there still but fewer and fewer, and they are much less loud. I'm pretty sure they'd be gone soon. You know what else has virtually vanished? People with bucked teeth. I remember being fascinated by bucked teeth people when I was a kid but one hardly sees them nowadays. Is everybody getting dental work done or what? What's really vanished is this sort of guilesss innocence many people used to have, particularly in the larger cities. I don't mean to be romantic and all but it's kind of true.... for instance, I remember we used to have this helper in our house. He was 50 something and I was maybe 8 years old. He'd come from Bihar. The phone rang and somebody asked him to answer it and he came with this look of shock and awe on his face. "I can hear somebody's voice on the other end", he said".! He couldn't believe a thing like the phone existed. We had another helper who was totally illiterate- as in couldn't read or write. Now? As I said even beggars in small towns have mobile phones. And I haven't come by a totally illiterate person in a long time. What else? Yea fewer cows on the road in the bigger cities. They are there but a lot less than I remember. Just as many stray dogs as before though. I mean a kind of notice this when I go to places like Varanasi and other small towns. In some ways what strikes me more is not so much what's disappeared but what's appeared and quickly spread-- for example so so many women in delhi and Mumbai and elsewhere too have coloured their hair blonde. Guys have become gym obsessed. And both guys and girls have tattooes. You see a lot of public display of affection between couples in the larger cities. Lots of other things... but basically urban Indians in many ways are not dissimilar to urban people in many other big cities.... the gaps are closing in. All these things were utterly absent even back in the 90s. When we got our first VCP ( It was only a Video cassette Player and not a recorder) in the early 80's there were no Video cassete rental shops in the entire district . Most of the people who owned the players had moved back home after living overseas. We used to exchange cassettes with each other. After a few months we had a chap who used to come with a big bag full of video cassettes once a week and you could rent them for a week ( Don't remember how much you had to pay). He had a list of most of the people in the district who had video players and used to cover each area on a certain day. He stopped coming by the early 90's after the rental shops started appearing on every street. Last edited by ukdoctor; Aug 1st, 2018 at 01:25..
A question that brings to mind a nightmare of an old remembrance: sweepers, crouching low, whisking across the floor in silence. There were those places you went to book and make trunk calls. And the call booths. And the telex counter at the post office. But the Ambassador really should be at the top of the list. Actually, Form C should be on the list as well. There used to be a banana called "Singapuri kela". It was long, slimmer than the industrial banana (Cavendish) and greener (ripe when still greener than yellow). They have vanished so thoroughly that no one remembers them, they claim the regular "hotel bananas" (Cavendish) are Singapuris. They are not; the length is very similar but not the diameter, color or flavor. I wonder what happened to Singapuris. Sorry, this thread is devolving into "things that have disappeared". Not entirely my fault.